Disney has spent more than $160 million in bringing a remake of ‘Beauty and the Beast‘ that has many of the exact same camera shots as the animated film from 1991, but with less heart and soul. The film indeed looks like one of those live primetime network musicals that have been airing every few months, but with a bigger budget. It’s that bad, which is unfortunate, because the 1991 animated film is excellent. Whatever was caught on those amazing animated facial expressions and voices are completely lost in this live action version with stale and choppy visual effects and digitized voices. Again, it’s awful. The story is the same, but Disney added in a few new songs, which were slow and terrible written, along with a backstory of Belle’s mother, which comes across as laughable. 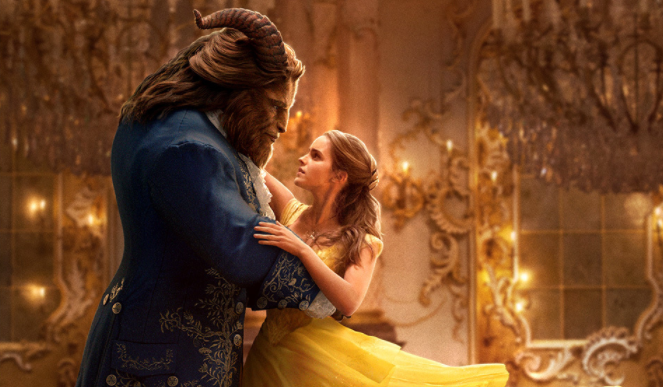 These additions made ‘Beauty and the Beast’ a very slow 129 minutes long. Now, I’m a fan of the cast here, but nobody particularly turns in a great job, minus the voice acting of Cogsworth (Gandalf himself Ian McKellen) and Lumière (Ewan McGregor), who are fantastic. Emma Watson is mostly lifeless and void of showing any emotion throughout the film, which is weird, because I’ve seen her do better in every other movie. Dan Stevens is of course a badass, but he’s covered up in CGI makeup that is so choppy, that you would think you’re watching a B-Movie. Not only that, he’s not singing, but instead, it’s a different voice. Luke Evans as Gaston is the strong point here, as he brings a certain hilarity to the role even if he’s the bad guy. His right hand short man LeFou (Josh Gad) is decent enough, but his schtick gets old 20 minutes in as the comic relief. It sounds like I didn’t like anything about the film, but that’s not the case. The costumes will for sure be nominated at the Oscars next year, and of course the music is still great, but the digitized and auto tuned voices bring down the quality to a stale rendition of excellent music. I beg the question to Disney with ‘What’s the point with these live-action remakes?’ If you’re going to use the same camera angles, same music and characters, and same dialogue, why remake it at all? Just re-release the original again – it’s much better on every level. Maybe it wasn’t such a good idea to get the guy who made the last two ‘Twilight’ movies to take over for a prized Disney film like this. The results are disastrous and mediocre at best. I’m sure the young crowd will eat it up, because there are sure a ton of visual effects from start to finish and princesses singing, but other than that, ‘Beauty and the Beast‘ is a sad excuse for a remake of a film that is beloved and treasured. SAVE YOUR MONEY AND WATCH THE 1991 ORIGINAL! This entry was posted on Monday, March 6th, 2017 at 1:24 pm	and is filed under Film, News. You can follow any responses to this entry through the RSS 2.0 feed. You can skip to the end and leave a response. Pinging is currently not allowed. « Film Review #2: ‘Logan’! [after his wife checks his crotch for a weapon] That's all John, sweetheart.